MWG, you have a pair of steel to attempt to review such a bad series. Kidding aside, I never thought a series with a villain as a star could succeed because you have to place them in situations of disadvantage . It robs them of their villainy. It was pitiful to see that scan of Doom whining about his losses to the likes of Daredevil. Yep the big draw here was the Villainic Duo of Namor/Doom against the world. For me it was the fun of seeing the two of them who have their own code of morality/honor in the reasons they act as villains having time to shine. The scheming, double-dealing, mistrust, tension filled atmosphere in knowing that both know they cannot trust each other for very long while hoping to achieve their own agenda's. Who will turn first? Who will win out? Who will they share their anger for in unity of a common goal? Here you have the 2 biggest FF "villains" in their own series. Even though these 1st issues are weak at best, the idea is sound and sales must have shown this to be correct or why continue? it does get better as the series goes along. Perhaps nothing "spectacular" and yet it is entertaining. Even good enough that DC enters the fray the very next year with their Secret Society of Super-Villains to highlight their colorful cast of villainy. I first read this about 12 years ago with the Essential volume. 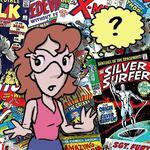 I had read a few random issues in the 90s. And I have to say, with tongue slightly in cheek, FALSE ADVERTISING. Why wasn't the book called "Doctor Doom and Namor"? They occupied most of its run. When I worked my way through the issues, I was hoping for some variety, e.g. Doom/Goblin, Mandarin/Leader, Kingpin/Hobgoblin, etc. 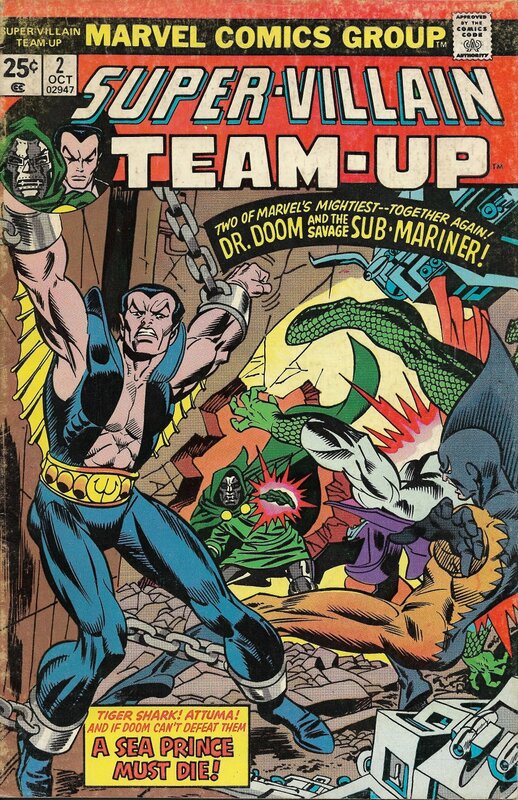 A book called Super-Villain Team-Up should not, in my humble opinion, have been mostly devoted to Namor/Doom. The stories were average at best, and I was sort of relieved when the likes of Red Skull and Magneto appeared. And whilst the final issue didn't knock my socks off, a Hate-Monger/Red Skull team-up was at least something fresh. I just don't feel the book should have been called STVU. When I bought the collected edition, and I never skip to the end or take a sneak peek at pages, I was losing the will to live with story after story of Namor/Doom. That said, I am enjoying this thread and the reviews by M.W. Gallaher. I just don't feel the book should have been called STVU. Super Team Villain Up would have been a terrible title. Erm, thank you for spotting my deliberate mistake. I was hoping someone would. We have to watch you taxi, you’re too clever for us. So far, the Gil Kane covers have been the highlight of the series! Attuma, Tiger Shark, and Dr. Dorcas have defeated Namor, but Doom is observing from his fish-cam, so the reader gets a recap of prior developments. Amphibian Bob Jennings escapes from the Jester Saru-San (why does this Atlantean have such a Japanese-sounding name? ), which is not of much concern to Dorcas. Tiger-Shark finds the fish-cam and wrecks it, so Doom heads to the rescue. 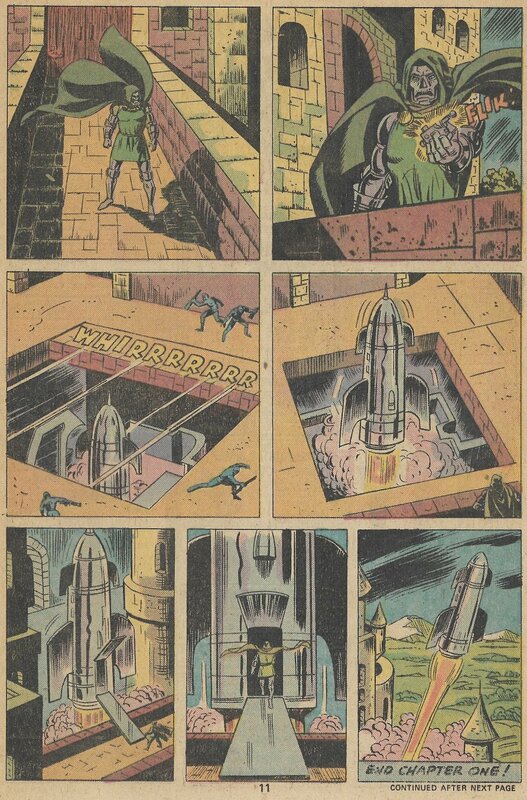 In Chapter 2, “The Way to Dusty Death”, Doom arrives on Hydrobase, where he’s attacked by the same defensive ray that Namor resisted in the previous issue. Doom’s armor absorbs the electrical energy, an idea he credits to his first encounter with Namor, back when Subby was appropriating the powers of the electric eel (and you thought this odd power from FF #6 had been forgotten!). Doom hypnotizes the grunts operating the Octo-Meks into colliding with each other. Watching all this is another amphibian, Betty Dean Prentiss, Namor’s girlfriend from the 1940’s. The now aged (relative to Namor, whose Atlantean body ages more slowly) and water-breathing Betty decides that maybe Doom just got the same kind of bad press Namor always had, and fills him in on the situation. Together, aided by Doom’s rock-drilling technology, they break into Hydrobase where Namor is strung up before the bad(der) guys. Namor loses it when Dorcas slaps Betty, and before Attuma and Tiger-Shark can restrain him further, Doom blasts them both. Dorcas decides to finish off Namor while he’s chained, but Betty leaps in front of the blast. This enrages Namor, who breaks free, furious that he’s lost yet another of his loves (the Lady Dorma had been killed years earlier in Namor’s solo series). We end with Namor glaring at his enemies while cradling Betty’s lifeless form. To Be Concluded! In fact, the scripting seems exceptionally skimpy for a Marvel super-hero book: Tony gives another tier of 4 panels the silent treatment later in the book, with a total of 13 silent panels throughout (not counting sound effects)…and that’s not counting one panel with the sole word balloon “Ohhh…”! Doom has more “screen time” this issue, but he’s still mostly superfluous. He could easily be deleted from the plot, but he does provide some action scenes in a story that’s fairly low energy otherwise. Not good action scenes, but at least it’s something! There’s a brief mention that the Hydrobase team are being forced to build weapons for Attuma, but it’s so easy to overlook that the story has a feel of pointlessness, with the antagonists just there to misbehave. Tony does try to deliver some emotional impact with the death of Betty Dean, but it’s a far weaker impact than that of her first reappearance years earlier, when the difference in apparent age between her and her former boyfriend seemed somehow more tragic. But there isn’t a lot to get too engaged with in Namor’s weak supporting cast, and this, once again, is essentially another issue of Sub-Mariner, not a super-villain team-up. Well, duh. Can't believe anyone didn't know you meant "Shut the Vishanti Up." I know I had this issue but I must've gotten rid of it not seeing much Everett to it. It might've been the last thing he worked on though given the date. He had been deceased around two years when this came out. ? I don't see much Everett in the three pages, either, and I see some hints that what's there may have been touched up by Marie Severin, and the final few panels, which show the fish-cam following Namor, appear to be non-Everett additions (Namor's in his fancy blue suit, which came months after Everett's death). This is almost certainly some work that had been lying around, from some abandoned project. 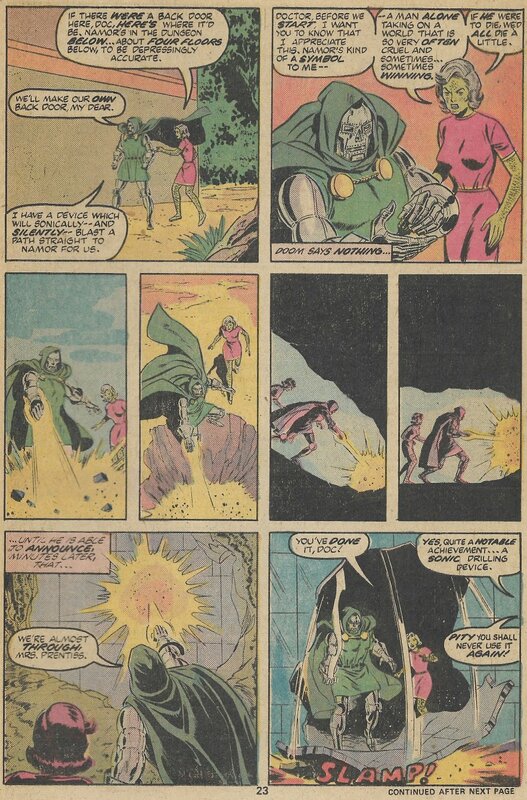 Clearly, Doom's departure from Astonishing Tales was abrupt, since the final panel of his last installment (issue 8) advertises a story, "Deathmasque," which never appeared, so maybe Everett was working on that story when Doom's series was dropped. Or maybe he was slated to return to Sub-Mariner earlier than #50--Dr. Doom had appeared just a few issues earlier, so maybe he had drawn some pages for #47 or #48 before they decided to keep Gene Colan on board a little longer? I think "Dr. Doom and the Sub-Mariner" would have been a better title than "Super-Villain Team-Up". 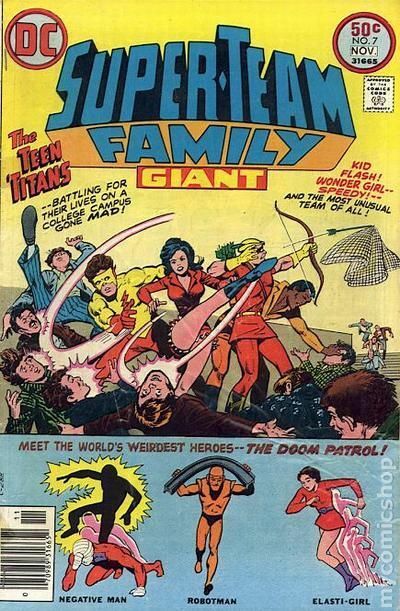 I always assumed that at least part of the motivation was to establish a trademark on "Super-Villain", although it didn't stop DC from using that in a title themselves. Supposedly trademark protection was behind SVTU's unexpected revival after a publishing hiatus, but we'll get to that later. Perhaps Marvel was satisfied to share the trademark with DC, as they did with "Super-Hero". "Team-Up" must have had some sales appeal, given that Marvel had three branded "Team-Up" titles, even if one was aborted after a single issue, but it certainly did imply (to the typical reader) some rotation headliner slots, so maybe they were reserving the flexibility to change the leads somewhere down the line (which, as we'll see, they did eventually do, to a small degree). 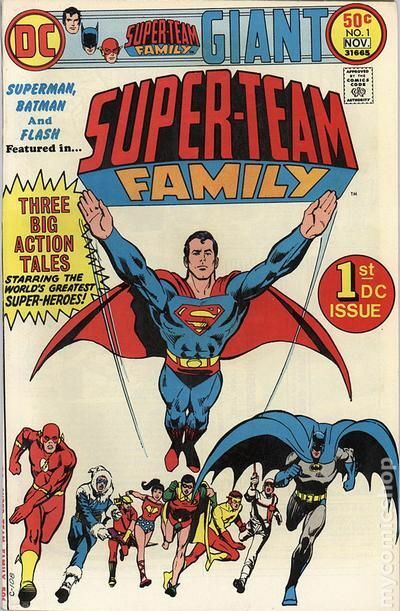 DC's "Super-Team Family" and the even less euphonious "Super-Team Family Giant" may have been the second-worst and worst of the various unwieldy team-up book titles. Good point about Doom not having much effect on the plot. I wonder if this wasn't a fill-in issue of the Sub-Mariner, repurposed and expanded after the title was cancelled. Maybe I expected too much. Like I stated, when I buy a volume of a comic I've never read, I don't skip through or take a sneak peek at later pages. I didn't really know much about the title, anyway, other than knowing it existed. So I was looking forward to a variety of team-ups. I mean, I wouldn't have minded if they'd kept Doctor Doom as the "permanent resident" of the title (in order to ensure sales longevity). 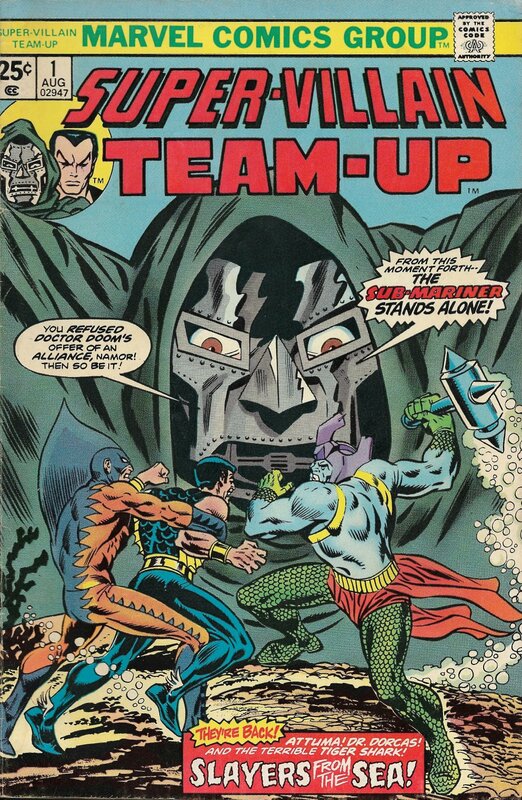 That would have been fine, and I'd have welcomed team-ups such as Doom/Octopus, Doom/Leader, Doom/Mandarin, Doom/Kingpin, etc. Not that anyone really teams with Doom. They THINK they do.